Welp, July and August were definitely some lame slow months for the blog. I don't have much of an explanation, other than I really tried to enjoy my summer. I won't always have this kind of time off! I got caught up on some projects around the house - I may or may not share a few of my successful ones - relaxed, visited friends, and got ready for the new school year. I had a wonderful first week of school with my new kiddos, and I'm ready to get back to sharing yummy recipes and more! I've got a great new recipe for you, and four reasons why you should make it ASAP. 1. This meal is tasty and healthy - what's better than that? 3. It's fun to try a variation of traditional chili - mix it up! 4. The slow cooker does all the work for you - perfect for a busy household. *Combine beans, onion, chili peppers, corn, tomato sauce, cumin, chili powder and taco seasoning in a slow cooker. Place chicken on top and cover. *Cook on low for 8-10 hours or on high for 5-6 hours (time will depend on number and size of chicken breasts). *Half hour before serving, shred the chicken - I did this in the slow cooker, but you can also remove and shred the chicken breasts before adding it back to the slow cooker. *Serve plain or with your choice of additions. 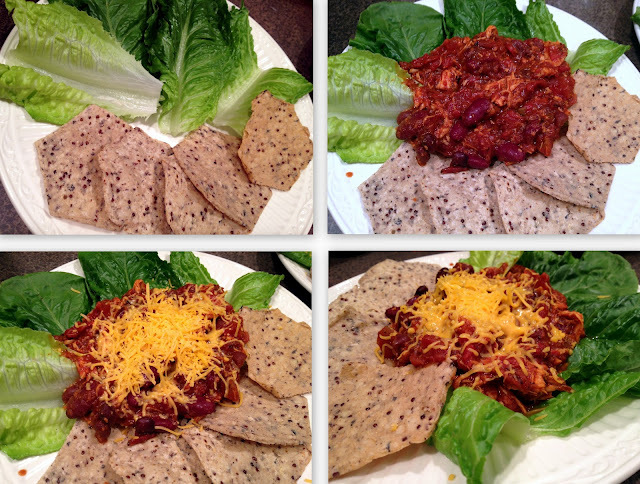 I suggest shredded cheese for topping the chili, plus lettuce and tortilla chips for wrapping and dipping. Yum! I love crock pot meals! I will have to try this. I hear ya on the blogging snooze...I've been super busy this summer with the kids home.